Sierra Leone’s hard won peace, after ten years of brutal civil war, which took the lives of over 200,000 people, leaving thousands amputated is today under attack, as ‘political greed and selfishness’ once again rears its ugly head. 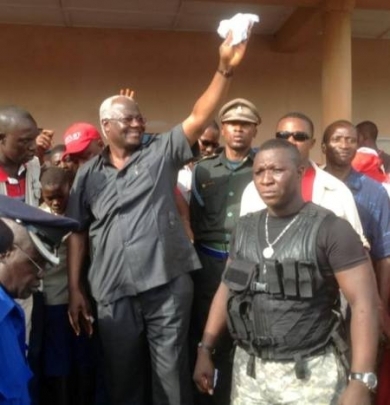 (Photo: President Koroma). Political and tribal frenzy, whipped up by those organising and supporting the campaign to amend the country’s constitution that could see president Koroma continue in power after his mandatory two terms, is now entering a dangerous phase. Politicians of all shades have now entered the fray, as youths belonging to the two main rival political parties – the ruling APC and the main opposition SLPP, turn up the heat on one another. The country’s Temne organisation – ‘RIM DIN SAA BENG’ – based in the capital Freetown, today announced that it “has observed with great concern, the recent spate of youth standoff in the country – between supporters of one political party against another, over political mantras likely to provoke a return to the old bad days of Sierra Leone”. Is Sierra Leone now sliding towards anarchy, instability and chaos? Yesterday, president Koroma was accused of neglecting his duty, after failing to distance himself or putting a stop to the reckless campaign sponsored by his close political allies, for the president to remain in office for another term – after 2017. Responding to the ruling APC party’s third term presidency campaign slogan – “After you it’s you – Mr. President”, the opposition SLPP are now saying loud and clear to president Koroma: “After Gbagbo – it’s you”. 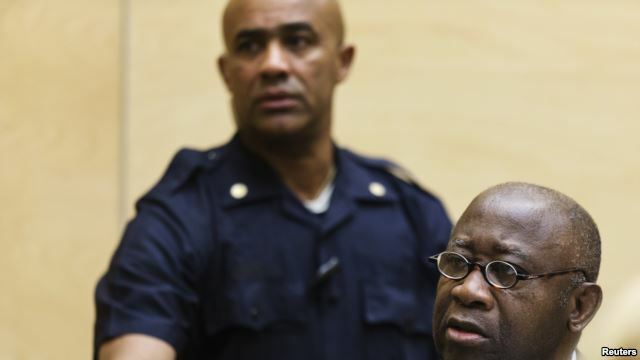 (Photo: Ivorian president Gbagbo brought to the Hague for failing to stop the political chaos in the country, which led to violence that took the lives of thousands. A powerful message to all African leaders). This war of words is now dangerously feeding the minds of the youths, 70% of whom are unemployed – languishing in apathy and boredom – a recipe for political violence and chaos. But this does not seem to concern the president and his supporters within the party, who in desperation to see the president remain in office after 2017, are willing to sacrifice the hard won peace and stability they inherited from the former SLPP government. President Koroma addressed the nation last Sunday, commemorating the fifty-third independence anniversary of Sierra Leone, holding in veneration former leaders responsible for destroying the country – Siaka Stevens and Joseph Momoh. This speech critics say, once again seriously calls into question the president’s sense of judgement and democratic credentials. But most importantly, the president failed to seize the opportunity to quell the rising political tension, created by his supporters – including senior ministers and advisers, campaigning for his continuation in office after 2017. Observers say that the president is fast losing respect and credibility among his peers in Africa in particular, and the world in general, as African countries take the democratic path towards progress and prosperity. 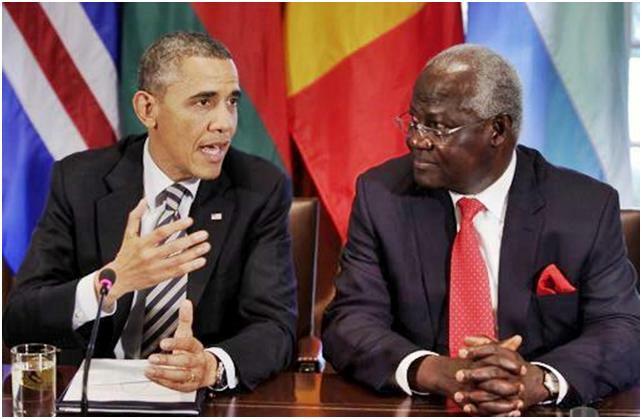 (Photo: Koroma and Obama). Opposition to the president’s three terms ambition is not limited to the country’s main opposition SLPP party. Temne and Kono members of the party are strongly opposed to any internal political manoeuvring that could destabilise the peace and harmony of the nation. In an unprecedented show of opposition to the three terms campaign as well as the vociferous response from the opposition, one of the Temne organisations in the country – RIM DIN ‘SAA BENG’ has today issued a press statement, calling for the government to turn down the ‘third term presidency rhetoric’. RIM DIN SAA BENG today has observed with great concern, the recent spate of youth standoff in the country between supporters of one political party against another, over political mantras likely to provoke a return to the old bad days of Sierra Leone. In the recent past, supporters of the ruling All Peoples Congress (APC) have intoxicated youths into believing and propagating a political ideology codenamed ‘AFTER U NA U’. This has been responded to by supporters of the main opposition Sierra Leone Peoples Party (SLPP) saying that ‘AFTER GBAGBO NA U’. Also, debates on radio by panellists from both sides of the political divide on Wednesday 30th April, show that politicians are again trying to engage the minds of the public especially the youth, in trying to convince them into believing their propaganda beliefs. Touched by the medley of concerns over these developments, RIM DIN SAA BENG being a Themne organization that is established to seek, promote and protect the interests of all Temnes, who by their size and number are very active participants in all spheres of development activities in Sierra Leone, and are also vulnerable, is disappointed over the development and so wish to caution the authorities on both sides of the political divide to take appropriate leadership measures to maintain the peace and stability of the country, and save the youth and country. In as much as we uphold Freedom of Expression, yet we wish that it is carried within the limits of the law, and that the youth, particularly Temnes and Mendes are advised to refuse temptation and desist from being convinced and dragged to the whims and caprices of politicians who are only interested in seeing their demise for their own selfish motives. The Government of Sierra Leone especially the Head of State His Excellency President Dr. Ernest Bai Koroma, the Leaders of the main Opposition and the Constitutional Review Committee are also advised to come up with statements that would caution supporters of both parties to maintain the peace, unity and security of the country. RIM DIN SAA BENG is a non-profit indigenous civil society organization that is non tribal but seeks to promote and protect the Temne people of Sierra Leone in peaceful co-existence with others in the best interests of national development. Tel: Chairman – +232-76-482-792 / Secretary General: +232 – 77- 443-611.